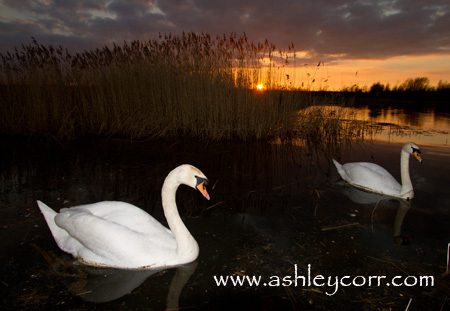 As promised, some new images that I captured last week at Rainton Meadows, Gods Country. With the nights getting lighter and the days seemingly becoming longer, it's been an ideal time to get out with the camera in my locality. Rainton Meadows Nature Reserve is part of the Durham Wildlife Trust and is situated just off the A690 in Houghton le Spring, five minutes drive from my home. Readers of my blog will no doubt have read about my previous visits to Rainton Meadows, especially during the Spring/Summer months when the place is a hive of activity. Many birds breed on the reserve during this time and this in turn attracts many visitors to the site, all of which are encouraged to stick to the designated footpaths - myself included (ahem!). As the sun dropped I decided to get my arse into gear so I headed round the meadows to catch a decent sunset. It was quite chilly, but when you find the swans in a prime location on the plot you tend not to feel the cold. I suppose you're that pre-occupied with landing some good shots that some of your senses become almost immune to the elements as your concentration levels are hiked somewhat. Mute Swans can be quite temperamental though, don't get too close, and beware otherwise you might get a pecked mush! During the last few years of photographing these birds I've had one or two close calls with them, but have never been clobbered as yet. Saying that, I'll probably get fettled during the coming nesting season when I push my luck near one of their nests. Down the years I've picked up a fair knowledge of their behaviour and especially their tolerance levels around people, or predators as they would percieve them. I always photograph from a safe distance, usually with my 300mm lens, although some Mute Swans are very tame and even feed from your hand, so getting up close to them is quite normal and they don't react. Never take them for granted though, as I've heard one or two stories where the swan has laid the law down and showed what it's capable of when riled. As the sun was about to set I fired off a few frames - ISO 100, aperture priority, using a flashgun instead of built-in speedlight, and recording each image in RAW format at a resolution of 18 megapixels, pulling in massive files of 102 megabytes apeice. Mind you, these creatures are a lot easier to photograph than most birds, mainly due to the fact they aren't very mobile, especially on the water. A loaf of bread is a must. Swans at the far end of a pond will very quickly swim across to you at the chance of a feed. 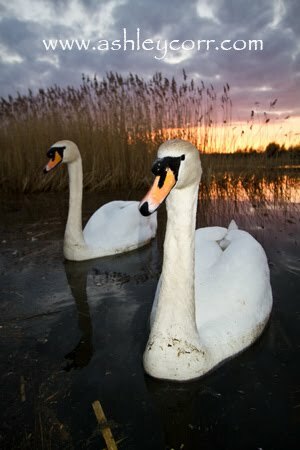 Once I was photographing Mute Swans with a dramatic sunset backdrop, then I ran out of Warburtons. Disaster! The birds buggered off in no time and there I was, feeling a bit blown out - they'd scoffed me 'quid-fifty' loaf and done a runner!!! For each good shot you achieve, you can easily land two or three poor ones, but taking plenty of shots will normally up the total of 'keepers' when you review them later on. 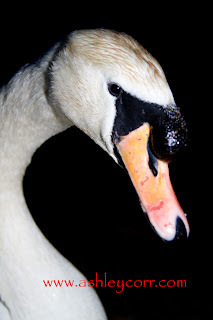 You're obviously aware of the welfare of the swans as you're photographing them, especially when using a flashgun, although on this occasion they weren't at all startled by the bright light. I photographed the swans at the waters edge for roughly ten minutes before packing my gear away and heading out of the reserve. There was no-one else around at this time, give or take the odd dog walker here and there, so the place was well calm - just the sounds of birdlife and a shotgun cracking in a nearby farmers field. Oh well, time to make me'sel scarce. I don't know what it is that attracts me and the camera to Mute Swans. One this is certain though - the ability to capture nice photographs of these birds is never too far away when you've got the rights components in front of ya. Still waters, a sunset backdrop, a pair of swans - oh, and don't forget the loaf o' breed, eh. Finchale Abbey (pronounced finkle) was a 13th century Benedictine Abbey, the remains are sited by the River Wear, four miles from Durham City Centre. It is a Grade 1 listed building and until recently there was an admission charge to the abbey, but now visitors can enter free of charge until the gate is locked at dusk. There are very extensive remains of a 13th century abbey, founded on the site of a retired pirate's hermitage. Part of it later served as a holiday retreat for the monks of Durham Cathedral. There are many excellent examples of heavily decorated capitals on the original arcade columns, tracery in the filled-in nave arches of the church, and on the south wall is a double piscina and two carved seats of the sedilia. The buildings and immediate grounds are now managed by English Heritage, with the surrounds converted into Finchale Abbey Caravan Park - an award-winning eco village project set up to sustainably manage development in the area. It was here that St. Godric settled in the 12th century, building a hermitage on a site which was to become his home for many years. 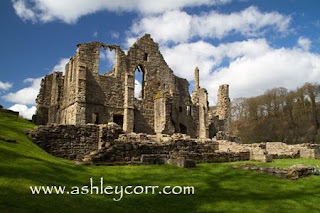 After Godric's death in 1170 at the age of 105, the Durham Monks set about building a shrine to the saint, the results of which can still be seen today in the substantial surviving priory buildings. St Godric's tomb still lies beneath the priory church and is marked by a simple stone cross. Today however, the tomb lies empty, his remains having mysteriously vanished many centuries ago since when there has been much speculation about his final resting place. Upon entering the latched gate you are confronted by the east facing remains thatit at the top of an incline which overlooks the river. A large bed of dafodils bloom in springtime, offering an ideal picture postcard scene of Finchale Abbey and its grounds. The many doorways take you on a tour of the remains, but tread carefully when you're climbing the ruins as these are a liability at the best of times. Photography of the Abbey was quite tricky during my visit, especially as the sun was very bright, so balancing exposure between shadows and sunlit stonework needed the aid of Neutral Density filters. Carrying a set of three filters of different calibrations, I was equipped with everything I needed for the challenge ahead. 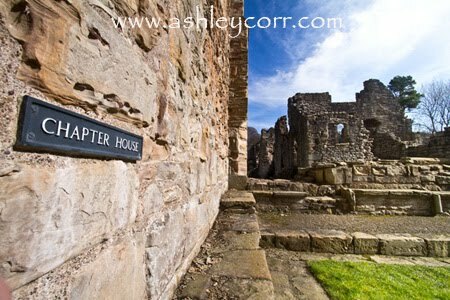 Photographing a ruined abbey can only keep you occupied for a certain amount of time. Capturing every path, wall and doorway can easily result in overkill so I set myself a limited target of 25 shots for my Finchale Abbey slideshow, to keep the viewer interested. I was at Finchale Abbey for approximately 45 minutes, yet I never passed another visitor in all that time - quite odd considering the nice weather conditions. Dog walkers were staggered along the river bank on the north side as I headed back across the wooden bridge. It was from here that I made the short journey through Cocken Wood and up the steep embankment to my car. I was ready for a sit down once I reached the top - I was bloody knackered! And that's all for now folks. Coming soon - more photo's of historical interest from my recent visit to Warkworth Castle in Northumberland. Thanks for visiting. 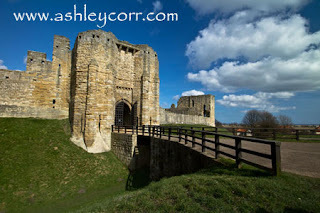 A recent visit to Bishop Auckland in County Durham gave me an excuse to stop off at a small village nearby, named Escomb, to check out another north-east landmark. One of the most complete Saxon churches in the UK, St John's, Escomb has been a place of worship since approximately 670 AD. The building materials that make up the church go back a lot further, though many were taken from the old Roman fort at Binchester, and Roman inscriptions can be seen on many of the stones used in the construction of the church. 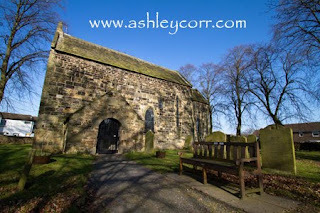 The church is located in the centre of Escomb village, 1 1/2 miles from Bishop Auckland. It is not known for certain when the church was begun, but archuitectural evidence points to sometime between 670 and 690 AD. This would make it one of the first Northumbrian Christian churches to be built. As with most Saxon churches the layout of Escomb church is very simple. There is a small south porch giving access to a narrow nave. The font is to the west of the south door. To the right, the nave leads under a high chancel arch to a very small sanctuary where the high altar is located. On the exterior south wall of the church is a Saxon sundial, believed to be the oldest still in its original setting in the entire country. There are only three lines on the sundial, corresponding to the three principal times of worship during the daily schedule of early monks. Under the lines a serrpent stretches. 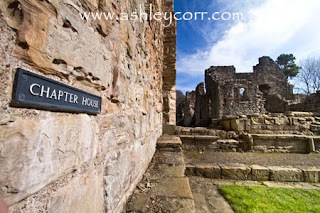 Several items on the exterior north wall are worth noting; a projecting lip of stone protects a Roman inscription. The stone was simply re-used by the Saxon builders of the church, so he inscription is upside down. It reads "LEG VI", meaning, Sixth Legion. Nearer ground level is the north door. This extremely simple doorway is generally accepted to be of Celtic origin. The surounding masonry work indicates that the entire doorway may have been taken whole from Binchester and reused here. Inside the church there is an absolute wealth of Saxon material. The south porch shows two Saxon stone crosses, and several other bits and pieces of interesting carving found on the site. Inside the nave, the font is extremelyt simple. 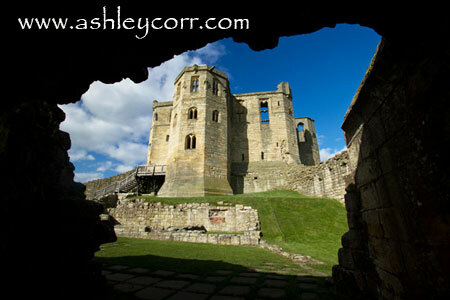 It dates to at least the 13th century, though it may be quite a bit earlier. Set high on the north wall is another Roman sytone, set on its side, and used as part of the supports for a Saxon window. The inscription on the stone reads, "BONO REI PUBUCAE NATO", which translates loosely as "To the man born for the good of the state". Moving up the nave you come to the Chancel Arch, where the Saxons again reused an existing arch from Bincheste Roman fort. 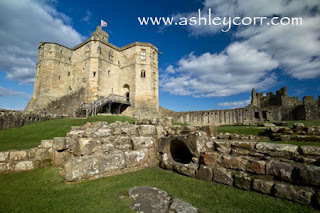 The stonework of the Romans was so good that no masonry was needed to set the arch in place. On the underside of the arch are paintings from the 12th or 13th century. Behind the high altar is a striking carving in the shape of a cross. This is believed to be a 9th century grave stone, but it may be the remains of preaching cross dating to the earliest days of Celtic Christianity in Northumbria, before the church was constructed. I was only at the site for twenty minutes or so but I managed to grab a couple of photo's inside the church grounds. Some of the gravestones dated back many years and I noticed one or two unmarked graves, which stirred up theories of what might have been. The graveyard was well maintained and I couldn't help wishing I'd been here a couple of weeks later when the many daffodils will be in full bloom. Never mind, I could always come back later on. 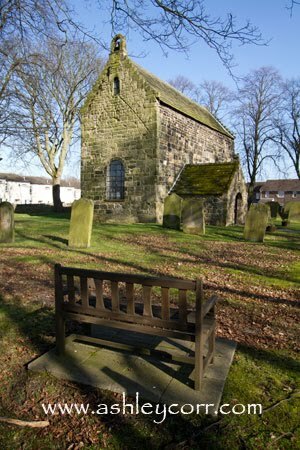 Taken as a whole, Escomb Saxon Church contains a wealth of fascinating architectural and historical detail, and is well worth a visit. 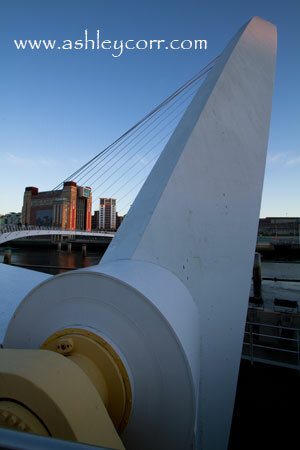 A mid-week visit to Gateshead Quays gives me a rather lame excuse to write another short blog entry. I earmarked this location as a good place to test out my new Sigma 70-300mm telephoto lens, but on arrival I had a change of plan and didn't even attach it to the camera body. 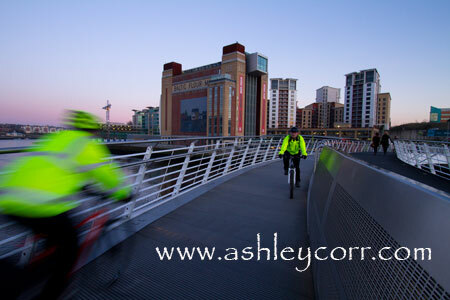 Instead I took some more wide-angle shots with the already attached 10-22mm glass, beginning on the Millennium Bridge, as cyclists passed every few minutes. My first shot shows one cyclist passing me as I took my first shot, handheld, with a slow shutter of 1/25th to capture the motion as he went past. It worked well enough. A similar shot can be found on my website, here, near the end of the slideshow. 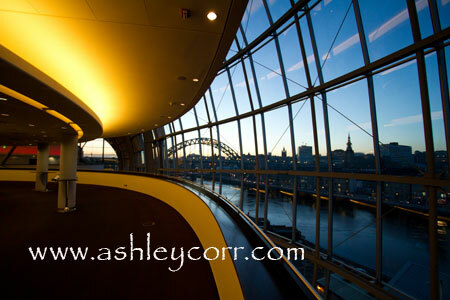 There were a few photographers kicking about on the Quayside, all armed with tripods to assist with those low-light shots. The sky wasn't doing much though and this is normally a key factor in achieving great shots at this location, as I've found to my own benefit. Never mind, it's still nice to get out and grab some decent shots after a days work. Since buying the Canon wide-angle lens it's covered around 90% of all shots taken. The bog standard 18-135mm lens has been forced to play second fiddle for the best part, but no doubt it will be back in the saddle sooner or later. I suppose my wealth of recent wide-angle shots is simply a measure of much I'm enjoying using it and it's almost become the ideal 'walk around' lens for the type of stuff I like to shoot. It's refreshing to take shots when practically on top of the subject, yet still not filling the frame. There's always a 'trade off' though, which comes in the shape of natural distortion that's delivered through the barrel - but hey, this can often add to the shot, giving dramatic angles that 'make' the shot. A fine example of this is shown here, in shot 2 of the Millennium Bridge, taken at the foot of the bridge on the north side of the River Tyne. From there I made my way back over the bridge. With fifteen minutes or so left on my parking ticket I paid a swift visit to the Sage Gateshead for a few interior shots. Auto ISO helped out with exposure due to the low light inside the building, especially during handheld shots as my tripod was asleep in the boot of my car. By this time I was well hungry so I made the short drive to Marlborough Cresent on the 'pink' side of town. Spice Punjab do a mean kebab so I was more than willing to pay the going rate, quaking in me boots as I waited for it, as the car was parked on a double yellow outside! Naughty. A fresh naan bread filled with different meats, loaded with salad, then splashed with garlic mayo, sweet n sour sauce, chilli and mint - it's gotta be tasted to be appreciated. Those black and whites can't play football, but they knock out some great scran!!!!!!!!!!! And that was that. Feeling hungry now. I wish I'd never mentioned that bloody kebab!